O'Ryans Village Candy Blog: Candy Cigarettes - Should They Be Banned ? This is a question that has been asked for years. Many believe that candy cigarettes encourage kids to smoke, there has been a lot of controversy over this subject. The name was changes a few years ago to candy sticks to help prevent kids from associating this candy with the real thing. In 2011 the FDA banned tobacco companies from making flavored tobacco's for cigarettes except for menthol. No longer is vanilla, cherry, orange or other flavor tobacco products are available. Some states have banned them and they are not as available as they used to be. Throughout the candy industry candy cigarettes has become quite the subject. While I don't promote kids smoking I find it so unreal the uproar this subject causes. Interested in what people think we asked this question on O'Ryans Village Facebook Page. Do you think candy cigarettes encourage kids to smoke and should they be banned ? I was actually surprised with the comments. Yes in a way they do but j don't think they should be banned they have been around for years .. Yes and yes...don't think kids should even act like they are smoking or pretend it is cool...I had them as a child and yes I grew up & smoked...have since stopped.. I don't think they encourage kids to smoke. I had them often as a child, as did MANY of my friends. Of my friends, I was the ONLY one who started smoking(I too have quit). I truly believe it was my parents who influenced me. They both smoked and the parents of my friends did not smoke. I wouldn't definitely let my granddaughters have them. No I don't think that they can be bad. I had them as a kid, however I never picked up real cigs. My parents don't smoke. I think its more the influence of the parents. If the parents smoke, than the kids tend to pick it up. Do not think candy cigarettes encourage kids to smoke. They are just a fun candy and that's why I bought them for my grandkidz. They arrived about 10 minutes ago. Love the fast delivery service. Will let you know about the taste after they get home. Afraid if I open that box, there won't be anything left for the kidz. No I absolutely do not. I know plenty of children who ate these & do not smoke today.If a child is going to imitate smoking ,they r gonna do it with a pen, pencil, straw,etc.Other factors figure into it.like if their parents smoke or if teens think it's cool or glamorous. The answer is NO, children try or don't try things as they grow, candy has nothing to do with it. My twin and I both liked candy cigarettes when children. She never trie to smoke, and I, well at 80, I still do smoke cigarettes and enjoy them. I will say, "if you don't smoke, don't start as they are habit forming and not good for you. Humans were made to inhale air, nothing else. These are just a few of the comments we received. When tallied up more fans agree that they do not encourage children to smoke and they should not be banned. My thoughts thoughts on this. While I no way encourage kids to smoke, I don't feel that candy cigarettes are the culprit when they do. Both my sons had candy cigarettes long before we had a candy store. They don't smoke today and think that it is a dirty nasty habit. Times have changed years ago it was cool to smoke, but that is not the case today. I do agree with many of the comments that were posted. Peer pressure along with parent smoking probably is a bigger influence then this old time candy. Another thought is kids always want to do what they are told not too, the bigger deal that is made out of not smoking might just want them to try a cigarette. Would kids still pretend to smoke if candy cigarettes were banned ? My guess is yes if they want to pretend they are going to find something to use. How many times as kids did you pretend using a pretzel rod, pencil, straw, roller up piece of paper or even a stick ? The more you tell a children no they more they want to. Do kids purchase candy cigarettes ? You may be surprised to know that most of the time it is adults that purchase them. Mostly because they bring back many fond memories from the past. 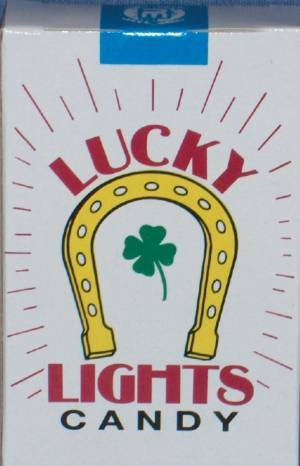 They are a favorite candy for 50's parties , class reunions or other social gatherings. When we had our physically store and a child would bring a pack to the counter to purchase we would also tell them they had to ask their parents first. We noticed that kids didn't really care for the pepsin taste and would more likely grab a chocolate bar, gummy candy or bubble gum. Will they be banned ? It's hard to say, but it would be a shame to see this nostalgic candy along with good memories and fun times disappear. Please keep in mind that is just my opinion. I always told my boys that if I ever caught them with a cigarette I would break their fingers. I bit drastic but it worked. Please feel free to share your thoughts or feelings we are always interest to hear what others think.